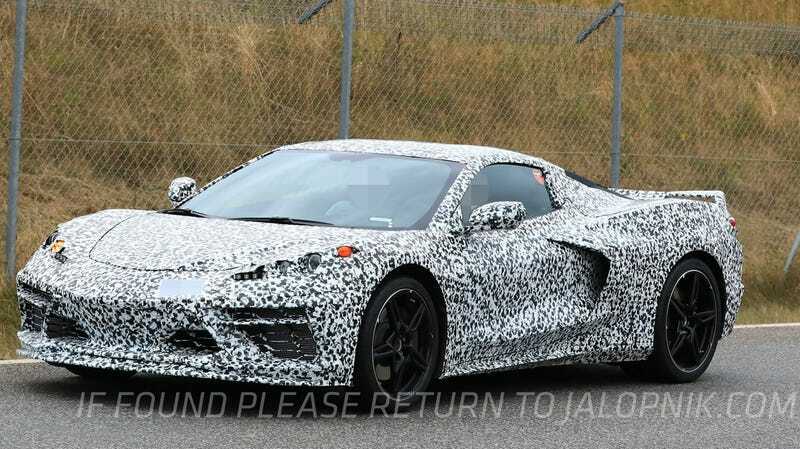 There is a lot of speculation floating around about the upcoming mid-engine Corvette. With a series of order guide documents leaked this afternoon, perhaps now we have more questions than we had answered. Where is the manual transmission option? Among many others. One particularly strange question revolved around option code XFQ. As you can see in For Sweden’s post, the XFQ option package calls for a 245/35ZR10 tire. That’s a really wide and really small diameter wheel. Where would you put the brakes? Drum? Inboard? And of course, I can’t help but wonder what that would look like. That’s where McMike comes in. What an incredible spy shot this is. I mean, where else would we have been able to find this rare testing shot with the proper XFQ option code wheel and tire package? I can’t help but wonder, though, if maybe this isn’t Chevrolet planning for a twin-front-wheel setup like the iconic Tyrrell P34 Formula One racer of 1977. Trickle-down tech from F1 to street cars always takes a while, but man, it’ll be super cool on the Corvette. Very bold move by Chevrolet to offer a six-wheeled sports car. It’s not often done, but I’m going to award a co-COTD victory to For Sweden and McMike. The joke wouldn’t have been as funny without both of them riffing on the same premise. Here’s hoping all of your cars feature tiny front wheels for maximum WTF!